The poets give voice to inanimate objects. In this case an extremely rare oriental, hand woven wool rug crosses one hundred years of time and brings a poetic message: “To Mrs and Prof. A. R. Simpson, the orphans of Antibe, Asia Minor” Hidden for almost 100 years, Armenian Oriental Rug dealer Oscar Tatosian of Chicago provided a private viewing of the rug for the Armenian Numismatic and Antiquities Society board. 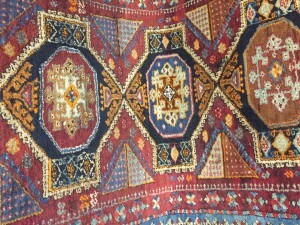 A beautifully woven rug with much symbolism. Staring at it for a few minutes brought an emotional response from this writer. Many small fingers worked for over a year to tie knots and create this special “thank you” to a Professor and his wife. These children, many of whom watched their parents die, now set their sadness, their nighttime loneliness, their hunger for their mom aside. And create. They create a work of art. 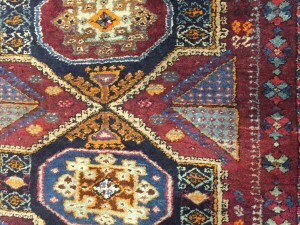 Certainly there are finer carpets with better wool, tighter weave and details that pop out. This carpet stands alone with its symbolism. Tiny crosses within triangle borders. Four large crosses fill the fields. The “S” patterns dot the fields—representing the ancient dragon symbol or the Armenian letter “D” for “Der”—for God. The colors could represent the American flag- red white and blue. Orphanages became part of Armenian reality at the turn of the twentieth century. Missionary reports count one hundred and fifty thousand orphans as of 1919. Armenian churches and community organizations, with the help of Missionaries from Europe and United States and the funding of Near East Relief (NER), established numerous orphanages and even “orphan cities” to provide a safe refuge for the orphans. Orphaned survivors, rescued children and women of all ages were placed in these houses. Besides basic education, the orphans were provided with the opportunity of learning useful skills to contribute to the life of the orphanage, and to help them earn a living after leaving. Among the few remaining fragments of the history of these orphanages are carpets woven by children as thank you gifts to donors. 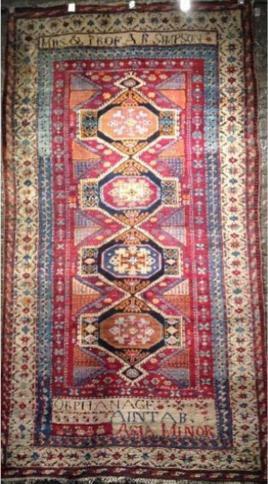 One of these resides in Evanston in the collection of Oscar Isberian Rugs. 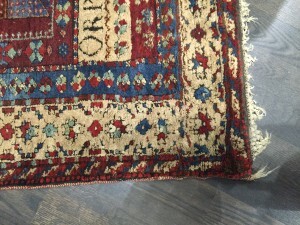 This “orphan rug” surfaced in the market recently, but the path of its journey to North America is a mystery. Inscriptions on the rug read “Mrs. & Prof. A. R. Simpson” at the top and “Orphanage, Aintab, Asia Minor” at the bottom. 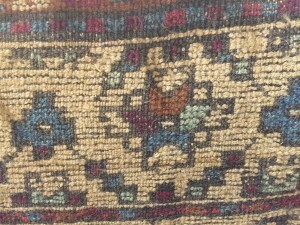 Undoubtedly it was woven at one of the orphanages in Aintab, now Gaziantep, Turkey, and was a gift to the Simpsons. We believe the benefactor is Rev. Albert R. Simpson Rev. Simpson was a missionary-minded pastor, a zealous minister to all immigrants, and the founder of the Christian and Missionary Alliance that is still active today. Although nothing specific is known about his support of Near East Relief or the journey of this carpet to Evanston, Simpson’s life story weaves tightly into the plight of the Armenian orphans. A Google Search reveals that Professor Simpson was Knighted. He was traveling with his son Reverend Hubert, during a mission visit to India. They represented the Scottish Free Church in their work with Christian youth outreach that took them all over the world. 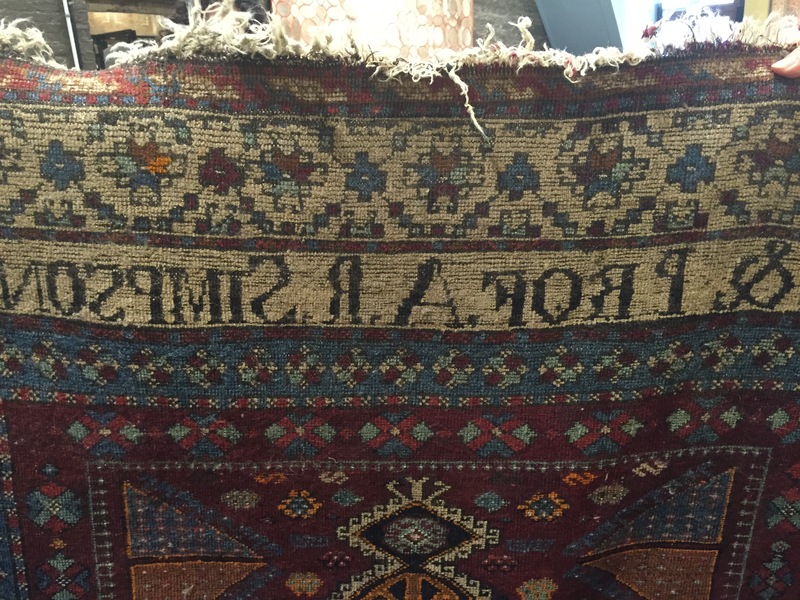 If this is the “Professor A. R. Simpson” represented in the rug, he died in 1916. That would mean it could have been made before 1916 or as a commemoration for his widow and son, Howard and another famous son James Young. James Young Simpson’s association with Russia began when Prince Nicholas Galitzin visited Edinburgh in the early 1890s. Simpson befriended him, and accompanied him on a visit to Siberia in the summer and autumn of 1896. The object of the journey was to visit Siberian prisons and distribute Bibles and other religious works to prisoners. ( Wikipedia) They say the apple does not fall too far from the tree. As I write this, I cannot find much about A. R. Simpson, however what I read about his sons is quite amazing. In times before modern transportation, these men risked all to spread the Christian Gospel. They traveled to the ends of the earth- Siberia, India and China. Aintab must have been a nice place for them considering their previous journeys. I plan on writing the University of Edinburgh to get information on their famous alumni. One of the earliest orphanages in Aintab was established in 1909 to house the survivors of the Adana massacres. However, a Scottish newspaper lists a boys orphanage in Aintab which was known for the orphan boys producing very fine carpets for sale. ON WEDNESDAY, an unusually interesting sale of work took place at the Friends Meeting House, Stramongate. 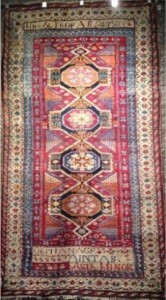 The principal stall, in the charge of the Misses Collinson, was filled with a quantity of Armenian needlework of exquisite design and finish, and which had been done by the Armenian widows and girls of the Friends Mission in Constantinople, the industrial branch of which supports about 200 needy Armenian widows and orphans. 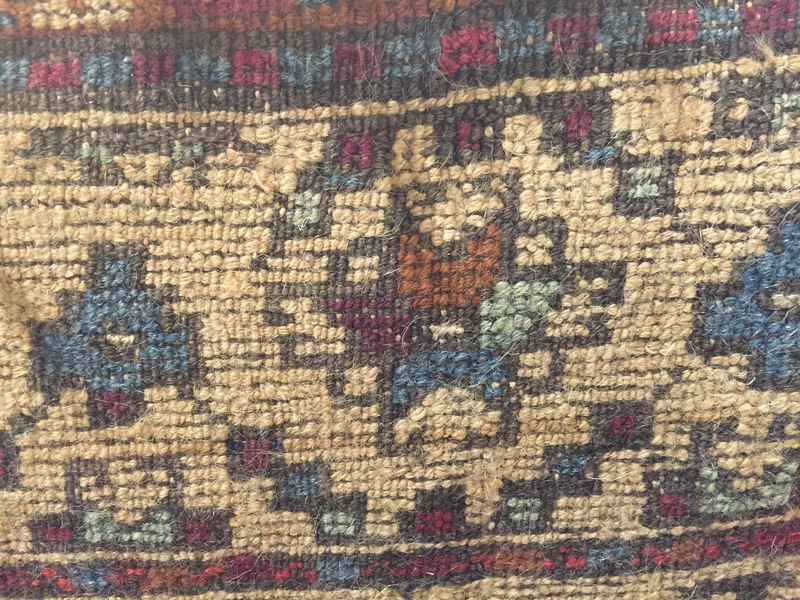 On another stall, over which Miss Benson presided, were some fine Persian rugs made by Armenian boys at the Aintab Orphanage in Turkey, of which Martha Frearson, an Armenian lady formerly know in Kendal, is the superintendent. Along one side of the room were exhibited a large number of very interesting watercolour sketches done by Katherine Allbright, of Birmingham, while in the East, and in connection with these and the refreshment stall, which was looked after by Mrs A. Simpson and Miss E.L. Harrison, a collection was made, and will be devoted towards the permanent endowment of a bed or beds at the hospital in Brumana, as a memorial to the late lady superintendent, and one of the nurses, who lost their lives in a carriage accident while in pursuance of their duty. The sale of work was organised by the Kendal branch of the Friends Missionary Helpers Union, which has been working a great deal for the Brumana Hospital, during the past six years. Four years after the Genocide the number of Armenians in Aintab’s population was reduced from thirty-six thousand to roughly sixteen thousand, including two thousand refugees from Sivas and Harput. The Varpakhnam (care for orphans) was one of the organizations that took the orphans of Aintab in hand; it opened an orphanage there in August 1919 where one hundred fifty children were living a few months later. Near East Relief also ran two orphanages in the city, both constructed in the upper part of the Armenian quarter. One was for boys, the other for girls; each had room for around six hundred children. This carpet could have been woven in any of these orphanages. 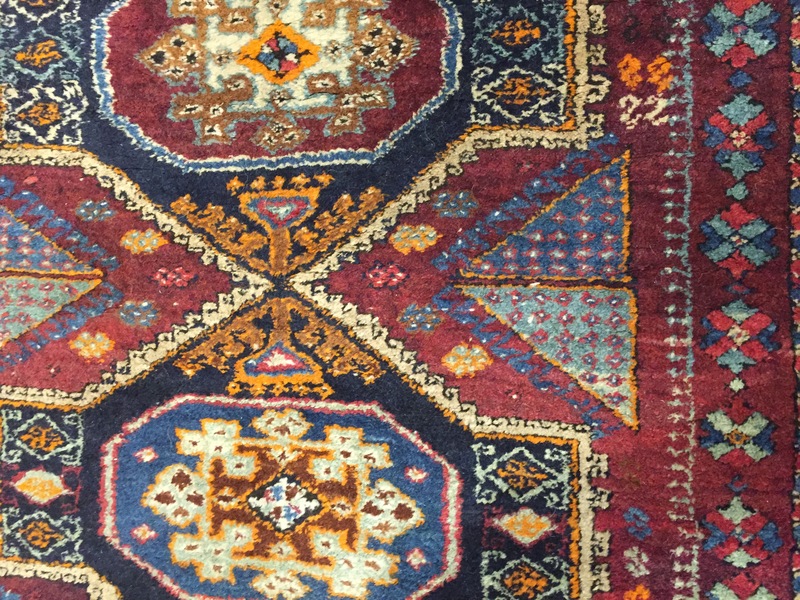 The inscription on the carpet does not provide any further clue to its origin. 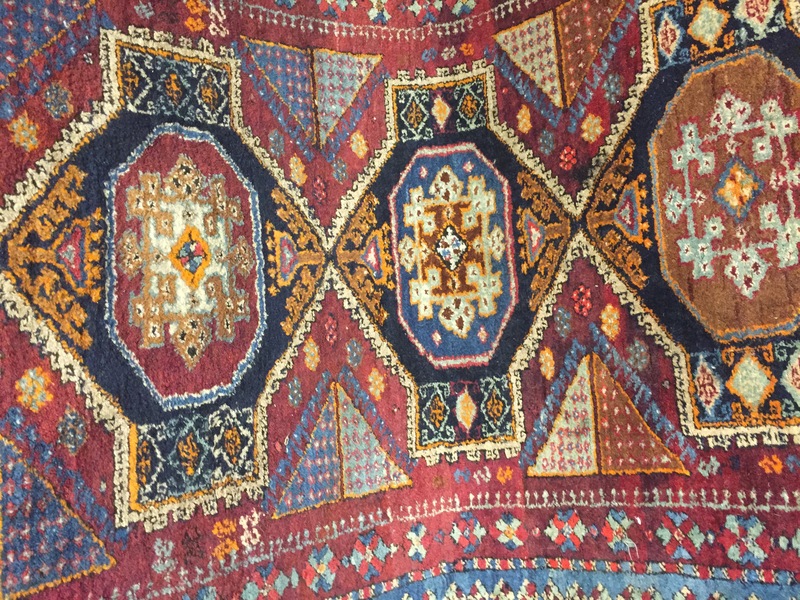 The value of this carpet is not its craftsmanship or skillful weaving; its pattern is not as sophisticated and elaborate as the more famous Ghazir orphan carpet. 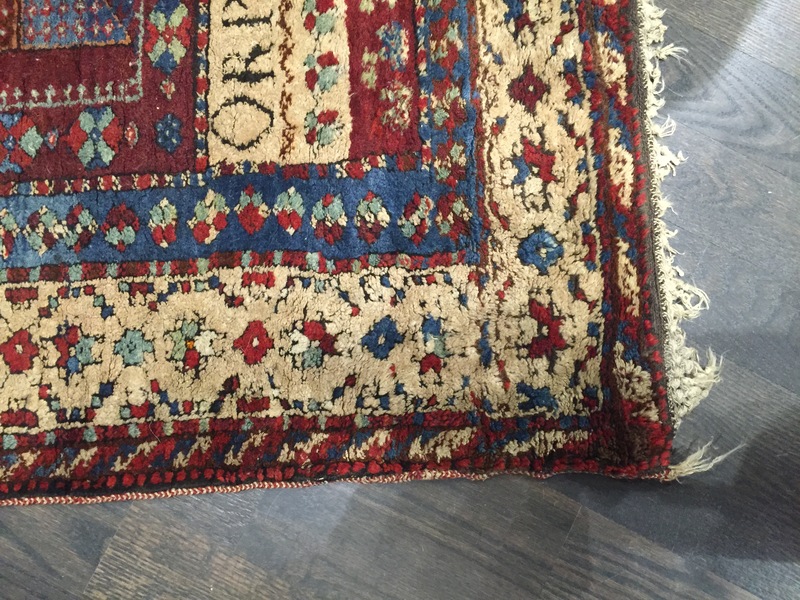 This orphan rug is simple and has obviously had a rough life. Its true value is in the memory of the hundreds of little orphaned hands who patiently added one more knot to the tapestry of Armenian survival history – a history that would not have been possible without our good friends. Size is 4.5′ x 8.2′, 80 knots per inch. *To learn more about Member Categories, to go ANAS Bylaws.